Kaley Cuoco and Karl Cook gave new meaning to “rocking” around the Christmas tree this year. After picking up their own yuletide evergreen, Cook proposed to the Big Bang Theory star on her 32nd birthday — and she said yes, sharing a close-up of her (gorgeous!) engagement ring on Instagram. In fact, thanks to social media, we can watch and swoon over the entire sweet saga. Cuoco revealed on her Instagram story that the day started like any other birthday, with the couple completing their annual tradition of picking out a Christmas tree. Cook showed up at Cuoco’s dressing room with flowers to spirit her off for the occasion, and at home afterward, he created a romantic candlelit dinner. 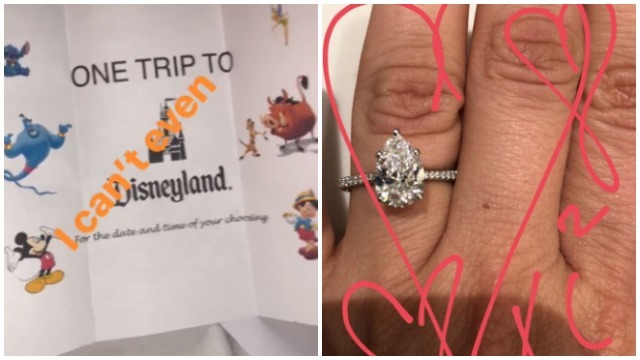 He even gifted her with a homemade coupon for a day at Disneyland. Clearly, this guy is a keeper. But the most precious gift of all undoubtedly came at the end of the evening, when Cook asked Cuoco to marry him. He shared the moment she said yes — after being too overcome with emotions at first to answer — on his Instagram account. Cook also shared a video of the couple dancing right after the proposal to Ed Sheeran’s “Perfect.” Warning: it’ll tug right on your heartstrings. “In life, there is nothing like dancing right after getting engaged. The purity and grace of the moment are inexplicable, it is truly as though life were a balloon bouncing on the smoothest zephyr. Honey; all I want is to be a balloon bouncing, bobbing, and flowing through life together. You are my everything @normancook,” Cuoco’s now-fiancé captioned the touching video. More: Can We All Just Get Over the Fact That Kaley Cuoco Falls in Love Fast? Cuoco and Cook’s love story began in the spring of 2016, the year following her split from her former husband Ryan Sweeting. Cook, a professional equestrian and son of billionaire Intuit founder Scott Cook, has never married. Congrats to the happy couple, and best wishes for a long and happy life together!